Despite the rain it's been something of a dry summer this year. When we look at new releases that have come our way over the summer months noteworthy stuff is few-and-far-between. And while this has given me the chance to ensure that all of the sleeves for our very own compilation have been made prior to release date, it's also had the side-effect of making for a very slow blog. Sorry about that. And now, like with the old bus analogy, many have come along at once. With this near-insurmountable pile of records to review it's Alcopop! 's split EP that's made its way easily and gracefully to the top of the pile. 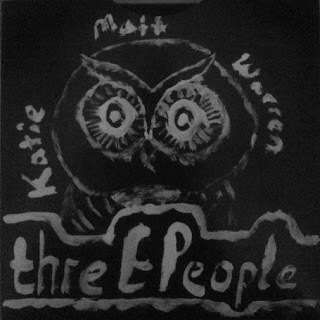 Limited edition and in a hand painted sleeve the threEPeople EP marks Katie Malco's debut release on the label and backs her up with new contributions from old hands Matt Emery (drummer in Stagecoach) and Warren Mallia (guitarist from The Attika State) with each contributing one acoustic number each. As usual, with this being Alcopop! it's a different way of getting this music out there and expertly highlights the talents of the three musicians. 'His Face Is A Map' is the opening number of the three and comes from Katie Malco. Definitely a cult artist in the making, it'll still be really great to see Katie break out from the underground pop scene and get wider acknowledgement of her talents. From the bare bones of the acoustic guitar Katie's multi-tracked vocals provide subtle harmonies which along with a swell of additional instrumentation brings the track to a nice climax. Her voice is incredibly pretty and gives the release an essential feminine touch. Matt Emery's contribution is the biggest surprise on the CD due to the previously reviewed Pulled Apart By Matt Emery download. Said EP of Pulled Apart By Horses covers focused mainly on Matt's vocal and classical sounding piano work. 'Ghost Dreaming', like Katie's song feels suited to a rainy afternoon, it's reflective and gentle sounding but with a strong tune. If on paper this sounds a bit too MOR then fear not, this sits in nicely with the indiepop that we're used to from Alcopop!, if somewhat contrasting to the catchy slacker-tunes of Stagecoach. Lovely! Rounding off the EP is '6 Shots', Warren Mallia's song. As Warren provides some vocals for The Attika State anyway this brings a more familiar voice to proceedings. A rawer cut than the previous two numbers '6 Shots' comes across very much like an acoustic track from his band. It's easy to imagine the acoustic riffs coming from a fully amplified guitar and backed up by the full might of the five piece line-up. Catchy with an up-beat tune that's nicely juxtaposed with the darker lyrics. This is classic pop songwriting. Autumn is by far my favourite season, and as currently I'm unemployed I'm looking for the perfect soundtrack to get me out of the house and job hunting on the wind-strewn and leaf-blown streets. Last time I was in this position Those Dancing Days debut record wormed it's way into my heart to become one of my favourite albums of the decade. There's a place again for a record to get under my skin in this way and the threEPeople stands a very good chance of being that.